Photograph depicts Alec Jackson speaking at a convention in Phoenix in 1968. Photograph depicts Aaron Riche installing Alec Jackson as outgoing Past Grand President of B'nai B'rith District #4. Photograph depicts a group of unidentified delegates including Dave Jackson (left) and Harry Buller (fifth from the left) . One man holds a totem pole figurine. 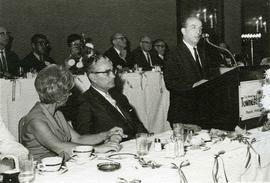 Photograph depicts Jack Spitzer, Chester Stoloff, and Alec Jackson at a B'nai B'rith convention in Phoenix in 1968. 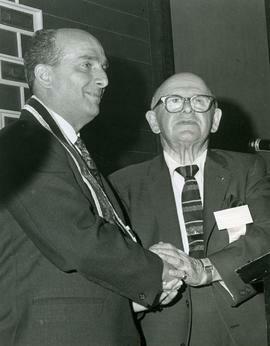 Photograph depicts Alec Jackson with a fellow attendee at a convention in Phoenix in 1968. Photograph depicts Alec Jackson being honoured at a convention in Phoenix in 1968. Photograph depicts Alec Jackson, Rabbi Shulweis, Rabbi Plotkin, and an unidentified man at a convention in Phoenix in 1968.